A cleaner that shines and protects your wooden furniture. Quickly cleans, bringing shine and protecting wooden furniture in your home. Eliminates up to 90% of allergens from pet dander and dust mite matter. Safe to use only on finished, sealed surfaces. Removes fingerprints and marks.Pledge Wood Furniture Polish beautifies and enhances the appearance of your wooden furniture. 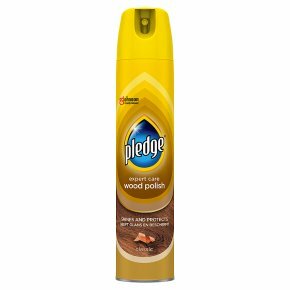 Use it all around the house to quickly clean, bring shine and protect ?all while leaving behind the Classic scent of Pledge. Its formula eliminates up to 90% of allergens from dust and pet hair and repels dust for 7 days. DIRECTIONS FOR USE: Read label before use. Do not rotate cap. Shake well. Hold can upright and spray about six inches from surface or directly onto cloth. For best results polish immediately with a soft, clean cloth. Do not use on floors, inner surfaces of baths, or unsealed wood. If in doubt, test on an inconspicuous area first.